Developed to expand on current global conversations around climate change, a new special section from the January/February 2019 Environmental Progress & Sustainable Energy (EP&SE) journal showcases the current thinking related to the reduction of carbon emissions, the utilization of CO2 that can ameliorate its presence and provide useful products, and storage options. Editor Martin Abraham’s Editorial states, “This issue was developed in part to expand on the current global conversation around climate change and the impact of emissions from fossil fuel combustion. The recent actions taken during COP 24 in Poland, although not as substantial as most would have liked, demonstrate the global objective to place limits on our carbon emissions, and scientists across the world are seeking new technical solutions that can guide policymakers on viable choices. Several of the manuscripts included in this special section can speak directly to those needs and opportunities.” Click here to read this EP&SE special section FREE for a limited time only. 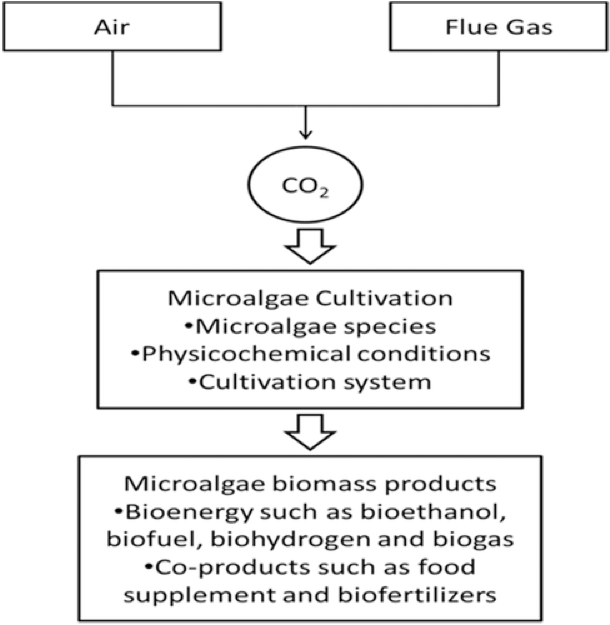 Flowchart of sequestration of CO2 by microalgae and production of byproducts from its biomass. The special section includes the review of a paper describing the driving forces for climate change and opportunities for mitigation, “A Review on Biological Systems for CO2 Sequestration: Organisms and their Pathways,” by Susmita Dutta and co-authors from National Institute of Technology Durgapur, India. EP&SE is a quarterly publication of the American Institute of Chemical Engineers (AIChE) reporting on critical issues of the environment, including remediation and treatment of solid or aqueous wastes, air pollution, sustainability, and sustainable energy.